A family affair: Are dynastic CEOs worse managers? Dynastic family CEO successions lead to worse management. How can this be improved? Family firms are the most prevalent type of firm in the world (La Porta et al, 2002). 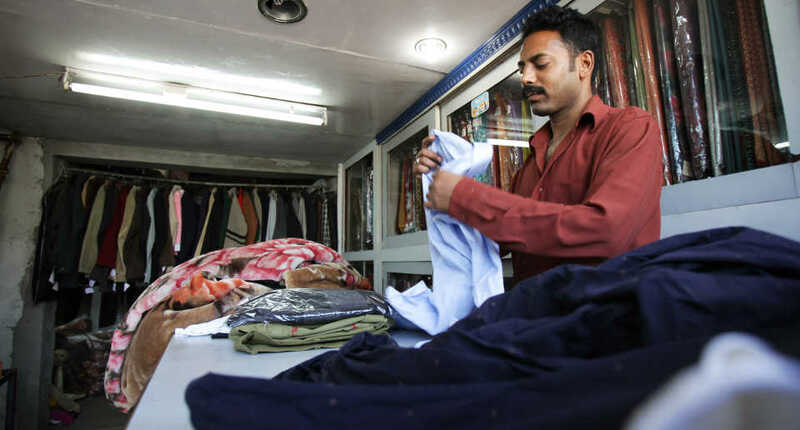 We find this is especially true in emerging economies, where family firms account for over half of medium-sized firms in the manufacturing sector. 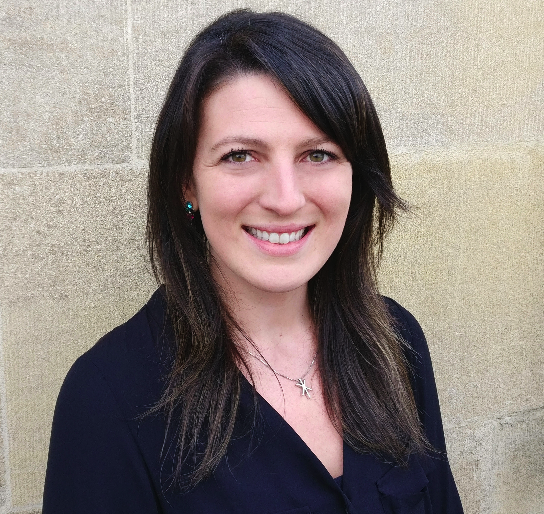 In particular, dynastic family firms – that is, where the founding family owns a controlling share and have appointed a second-generation (or later) family member as the CEO – account for a quarter of these firms. Supporting such firms as the ‘backbone of the economy’ is politically very popular, so it is crucial to understand more about these firms. More specifically, we need to understand how they operate and what their impact is on the economy and labour markets. Although there is mixed evidence on whether family ownership is a good thing, the weight of the evidence is that dynastic family CEOs are usually bad news for productivity (e.g. Bertrand and Schoar 2006, Bennedsen et al. 2007). But why is that the case? Poor management practices have been widely shown to causally affect productivity and in a recent study, Renata Lemos and I show the first causal evidence that dynastic family firms have worse management practices (Lemos and Scur 2018). Combined with production function estimates of the correlation between management and productivity, this effect implies a possible productivity hit of 5% to 10%. But if adopting these practices leads to better firm performance, why are CEOs not already adopting them? To consider the reasons behind this managerial underperformance, we build a simple stylised model to explore how reputation costs specific to family firms, which seem to push the first-generation CEOs to do better (Belenzon et al. 2017), might act as a constraint on management innovation for second-generation CEOs. Despite the global prevalence of family firms, research on this topic is often stymied by lack of good data on private firms. One large project that has worked to remedy some of this gap is the World Management Survey (WMS). The WMS uses a survey tool covering 18 management topics scored on a scale of 1 to 5 (worst to best). Having worked on this project for nearly a decade, we noticed one stubborn pattern across countries: family firms consistently placed in the bottom of the management quality rankings. 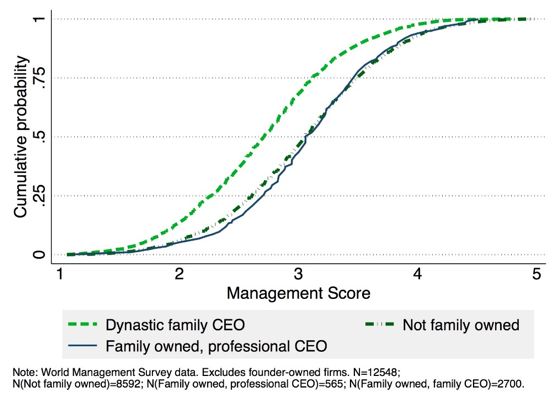 Figure 1 shows the cumulative distribution of management scores for firms run by dynastic family CEOs, firms run by a professional CEO but owned by families, and all other non-family firms. What is immediately obvious is that, much as the literature suggests, family ownership does not seem to be an issue per se, but rather the difference seems to be driven by the choice of CEO. However, one can think of a number of other stories that would also fit this stylised fact: for example, if the firms that stay as dynastic family firms are so bad that only family members would take them on, the underperformance in management is due to a selection effect rather than the CEO’s identity. Previous research has primarily focused either on public firms (Pérez-González 2006), or private firms in OECD countries (especially exploiting the rich datasets of Scandinavia) (Bennedsen et al. 2007). As the data we needed in emerging economies were not available, we developed a new survey to collect data on the history of succession of ownership and control, as well family characteristics of family CEOs across countries. We used the WMS sample of firms and interviewed over 2,700 firms in 2014, with a large share of the sample coming from emerging economies. The first thing we noticed was that over half of the firms we interviewed were still first-generation founder firms or had not been founded by a single family or founder. Although this will allow us to have a great look at entrepreneurs in Latin America and Africa in a future paper, the analysis in this particular project was aimed at second-generation CEOs. At the end, a total of 810 firms from 12 countries had changed hands from founders into either second-generation family members (dynastic succession) or professional managers. To identify the causal relationship between a dynastic CEO succession and management quality, we used variation in the family characteristics of the outgoing CEOs. More specifically, given the total number of the outgoing CEO’s children, how many of them happen to be boys is as good as random. This gives us a neat way to tease out the effect of a dynastic CEO. We find that outgoing CEOs who have at least one son are about 30 percentage points more likely to keep the firm in the family than those who had no boys. Figure 2 depicts this pattern: for each category representing the number of sons of the outgoing CEO, each block indicates the identity of the new CEO. 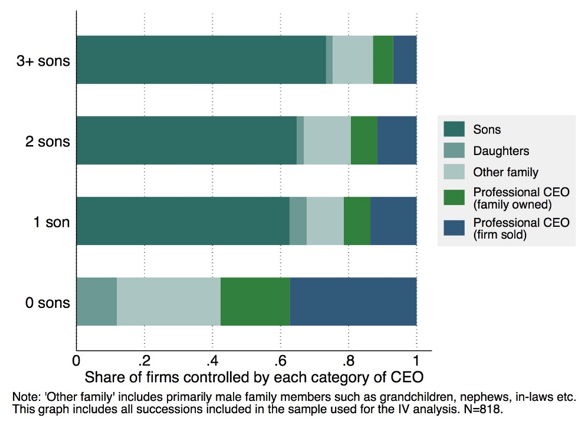 Assuming that the gender of the outgoing CEO’s children is unrelated to their choices of management practices, we estimate that a succession to a family CEO leads to 0.8 standard deviations worse management practices relative to firms with successions to non-family CEOs. But why might that be? The second part of our analysis focuses on understanding why firms led by family CEOs adopt fewer structured management practices. There are a number of reasons underlying the difficulties in effecting organizational change, and the two mechanisms often ascribed to family firms relate to lower levels of skill (Bloom et al. 2012, Bennedsen et al. 2007, Pérez-González 2006) and lack of awareness of managerial underperformance (Bennett et al. 2014, Gibbons and Henderson 2012, Rivkin 2000). However, neither of these mechanisms fully explains the gap in management underperformance. We propose a different possibility based on the wealth of evidence that suggests family firms have implicit employment commitments with their workers. Evidence of such commitments includes providing better job security as a compensating differential for lower wages (Bassanini et al. 2014), and firing fewer employees when hit by negative productivity shocks (Bach and Serrano-Velarde 2015). This type of implicit commitment may be even stronger in emerging economies. We build a simple theoretical framework and propose that, because of these implicit commitments, family CEOs incur a ‘reputation cost’ of firing workers. 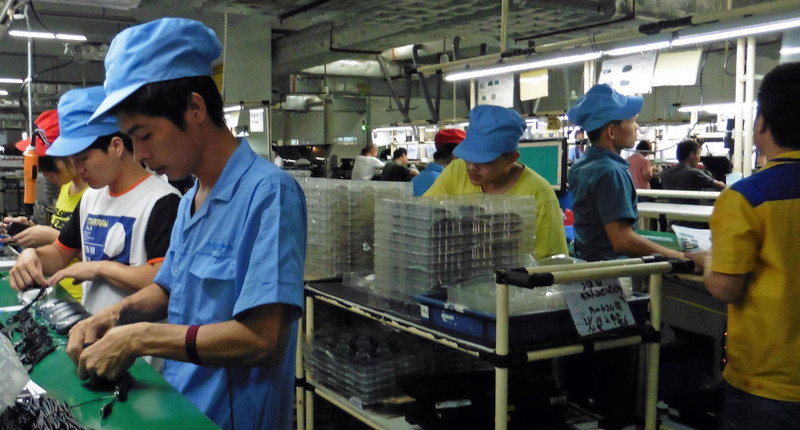 If we think of management as a monitoring technology that allows CEOs to observe their workers’ productivity, it is only gainful to invest in the technology if the CEOs then use the information to discipline the low productivity workers. Thus, the reputation cost incurred by family CEOs may act as a constraint on investing in this technology. We find empirical support for the predictions of the model. Although a naive solution could be that all family firms hire professional CEOs, that would be an unrealistic prescription. Particularly in emerging economies, there are binding institutional constraints that bar many firm owners from pursuing this avenue. For example, there might exist thin markets for managerial talent (Bloom et al. 2013) or weak legal systems (Burkart et al. 2003) that fail to protect owners from devious CEOs. There is also the fact that owner-managers preferences for being their own boss might be high, especially if there are large gains from doing so because of political connections and such. So if we accept family control is the necessary (or preferred) control structure for many firms, it is crucial to understand what the barriers to investment in better management practices within family firms might be. We propose that the implicit employment commitments between family managers and their workers should be taken into account when designing and implementing management-upgrading projects. This is a key consideration as many organisations push forward in enacting such projects around the world. Editors’ note: An earlier version of this column appeared on the World Bank’s Development Impact blog.